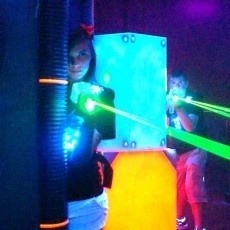 The Ultimate Laser Tag! We feature world class laser tag & Cincy's original Indoor Trampoline Park. Our themed multi-level laser tag arena, the world's top-performing laser tag system with cool alien green lasers makes it the Ultimate Laser Tag. Also, try out our Indoor Trampoline Arena park where up to 20players can play air dodgeball or just bounce off the walls on the 54' x 54' tramoline park! We have arcade games and fresh-made pizzas and PRIVATE party rooms.